The TLX is a 4-door sedan that was introduced for the 2015 model year as a replacement for the smaller TSX and the larger TL. Situated between the ILX and RLX in Acura’s lineup, the TLX puts an emphasis on comfort, technology, safety, and performance. The TLX is unchanged for 2017, although it can now be equipped with a GT Appearance Package. Like the rest of Acura’s lineup, the TLX is available in a variety of different configurations. Drivers can choose between the base 2.4-liter inline 4-cylinder engine or the optional 3.5-liter V6. The TLX is one of the only cars on the road to feature all-wheel steering, which can be had in either the front-wheel drive 4-cylinder or V6 model. Acura’s trademark super-handling all-wheel drive is only available with the V6. The hardest decision facing most TLX shoppers will be choosing between the different engine configurations. While the 4-cylinder engine offers less power on demand, it still has plenty of zip, and its decreased price and curb-weight make 4-cylinder TLXs easy on the wallet and nimble in turns. The 6-cylinder produces a very respectable 290-horsepower, and Acura’s all-wheel drive system continues to be an appreciable advantage over their competition. Both engine configurations are paired to an automatic transmission with paddle shifters. Additionally, the 4-cylinder TLX’s EPA-estimated 24 mpg city/35 mpg highway put it ahead of the vast majority of cars in its class for fuel efficiency. 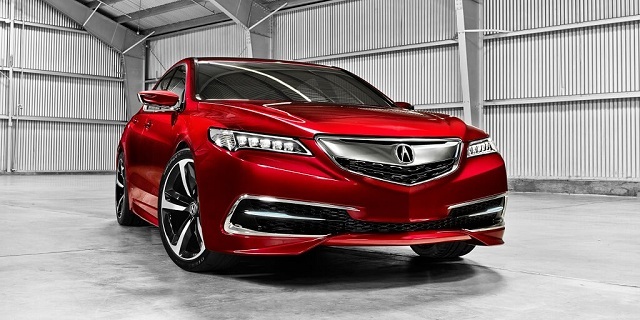 Acura continues to refine its focus on the features luxury drivers value the most. The TLX conquers road noise with ease, and its interior is full of comfortable, perforated leather and real wood. The TLX comes standard with Acura’s dual-screen center console, which feature a larger touchscreen below a slightly smaller screen that is primarily used for navigation. Acura’s ELS sound system works brilliantly with the TLX’s quiet ride, and the navigation system allows you to get directions and find specific locations using voice commands. Safety features have become one of Acura’s serious advantages in the luxury segment, and all of them are available in the TLX, although not all come standard. Forward collision warning, Lane Keeping Assist, Blind Spot Monitoring, Rear Cross Traffic Alerts, Adaptive Cruise Control – the list of features that can be found in the TLX make it clear why Acura is the only luxury manufacturer to earn top safety rankings across its entire lineup. If you find joy in driving and value your comfort, safety, and the resale value of your vehicle, you will be hard-pressed to find a better fit than the 2017 Acura TLX. Both of the TLX’s engine options present their own benefits, and the highly-configurable nature of Acura’s trim levels means there’s a perfect TLX for just about any luxury buyer out there.